I'm always looking for an excuse to dive into my bits bin. Seeing these hearts on Sarah's instagram feed was all the excuse I needed. I dumped my bits bin in a laundry basket. This lets me see more bits at one time and keeps them contained as I rummage around looking for the perfect bit. 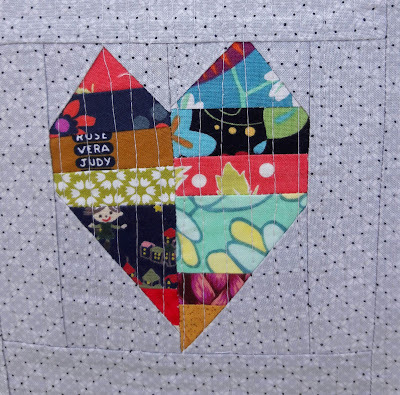 I made strip sets that were about the same size then added background to three of the corners, sewed them into hearts. Before I knew it I had nine wonky hearts. I sewed those into sets of three grouping them by similar width. Added a little background to the top or bottom of each set to stagger the hearts and make each set the same size. I added a strip between. If I were to do it over I would have only added strips on either side and made the hearts closer in the center. I didn't take into account how they would curve around the pillow form. Oh well live and learn. I would love to make throw pillows like this for my couch. But I have a naughty doggy that eats pillows and makes it look like it snowed in my house no matter what time of year it is. That naughty dog is not allowed in the bedrooms. 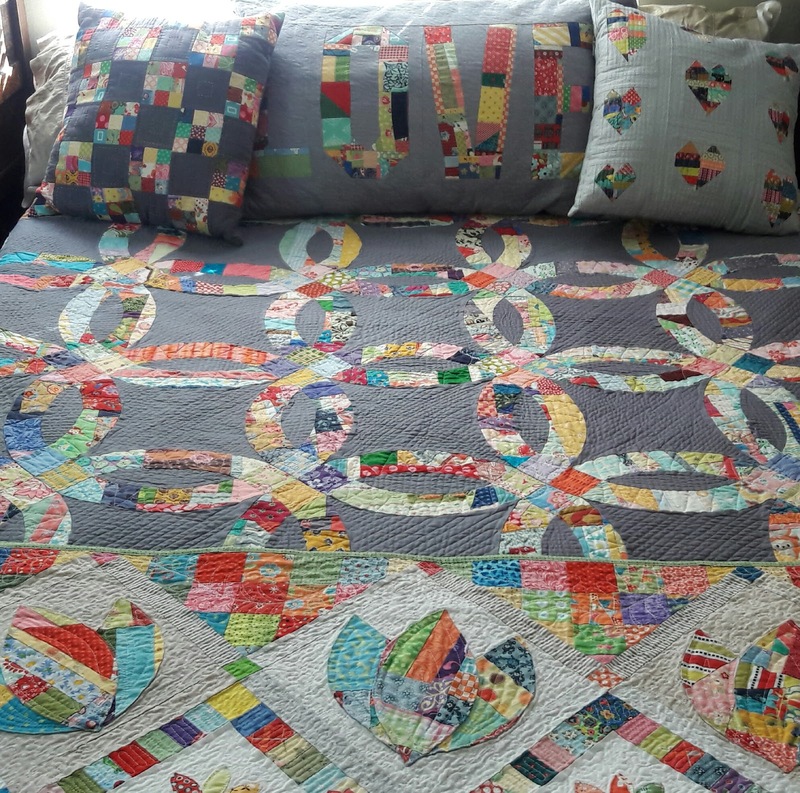 Plus it makes a lovely addition to my scrap happy bed. 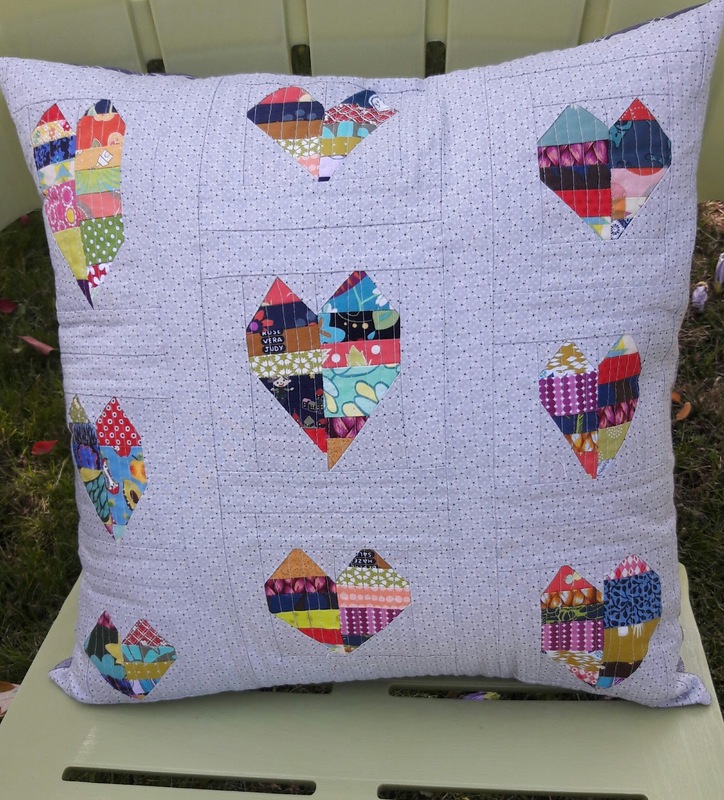 Love the pillow, and your scrap happy bed. Wow! There is some wonderful scrap happening here! Beautiful! Oh my stars!! it's beautiful!! I love it! Great heart pillow!! I like your idea of putting your scraps into a laundry basket while choosing. Love those scrappy little hearts! Thanks for sharing with Oh Scrap! What a great make! A scrappy happy place! 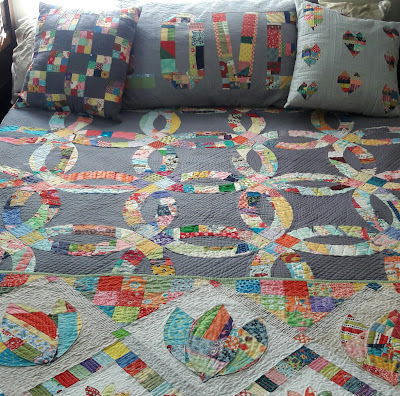 Love, love, LOVE that scrappy happy bed!!! Your heart pillow was a great addition.